It's here! A little early Christmas present for you... the Free Shell Infinity Scarf Pattern! Just click the link to open a printable pdf version. Row 3: Chain 1, sc in first dc, *skip 2 dc, 5 dc in next sc, skip 2 dc, sc in next dc. Repeat from * 2 times more. Repeat rows 2 and 3 (turning each row) until you make 94 rows or until your scarf is 52 inches long. Fasten off, leaving a long tail end. Using your yarn needle and the long tail end, stitch the two ends together with a whip stitch. Merry Christmas and happy crocheting! thank you it is very pretty will have to give it a go !! Thank you! I've recently started crocheting again and I'm enjoying it so much. This looks really pretty. I'm new to your blog and I love it! I was searching for crochet infinity scarves online and this pattern came up. I love it! I started it yesterday and I'm about halfway there. I'm trying to branch out more as far as patterns go and I love this shell style. Thank you so much! Too gorgeous!!! Love the color! Thanks so much for sharing the pattern! I'd love for you to visit my blog. This is beautiful. I have a link party called Wednesdays Adorned From Above Blog Hop and would love to have you share this and any other posts with everyone. It runs from Wednesday through midnight Sunday. Here is the link to the party. I'm just learning to crochet. Will pin this beautiful pattern for after I've had more practice! This is so pretty. I'm always looking for easy crochet patterns, and this is one that is right up my skill level. Thanks for sharing! 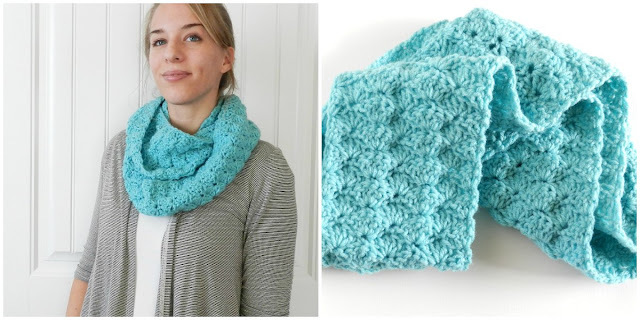 I love the color and the shell stitch! The scarf is beautiful! Thanks for sharing, I can't wait to make one! Stopping by from Someday Crafts. Gorgeous Scarf! Thanks for sharing the pattern! Awesome! I love infinity scarves! Found you through Delightful Order's Link Party. This scarf is absolutely beautiful! I love the color. Thank you for posting a pattern. I am on my way to check out your other patterns,right after I pin this one! Beautifully done and I love the color! Visiting from The Shabby Nest. I love this...just finished one in red. was quick and easy! thanks so much! I don't suppose you know how much yarn this took? Hi Stacy. It takes about a ball or 3 oz. I had two and made a headband too. Thank you for sharing this beautiful pattern! I'm a newbie at crocheting and I just wondered how many skeens of yarn to buy. Can't wait to make! Are we turning this after every row? If so, you forgot to mention it in the instructions!! Sorry I forgot to mention that- yes. do turn it after every row. Hi, thanks for sharing this pattern. Love it and making it now. May I know how wide is the width? Mine seems rather narrow. May have to add in more stitches. After I complete row 3, how many chains do I do before I continue to row 2 and so on and so forth? I'm confused. Other than that, I love the pattern so far. thank you. I'm not completely sure I understand your question, but you ch 3 at the beginning of row 2, and you ch 1 at the beginning of row 3. Is that what you are asking? I hope that is clear. Hi, Thanks very much for the pattern. I liked it so much I made a headband with the same pattern. With the headband I doubled up on shells (6) and when finished I doubled it over for extra warmth. Oh yeah, also added a cute little flower for a finishing touch. You are welcome and I love that you created your own headband too! Awesome! I wish you could upload pictures here. Had the headband on today and it is -13 C. Kept my ears nice and warm. You can share your photos on my Facebook page if you are on facebook. I'd love to see it! Working on my second one from you pattern! It is easy to follow. Thanks for sharing! That's great Angela! I'm glad you are happy with this pattern! What multiple should you crochet in for the foundation chain to expand the scarf? I would like to know this too! Please! Thank you! I would like to know the multiples also. I want to make this for someone tall. I know this post is from a while ago, but I started to make this scarf and it seems really narrow. What is the width suspose to be? Thank you. I'm sorry I don't remember the width. I don't have that scarf anymore so I can't check. Try adding some extra chains onto the foundation chain or use a bigger hook to get some extra width.